Is your summertime fun focused on your yard? If you are planning on entertaining outdoors, there is no need to have a large backyard to reap the benefits for entertaining in the open air. And there’s no need for a major landscaping project if you’re not ready for a yard makeover yet. With just a couple of items, your space can be turned into a stylish outdoor room that can be enjoyed by everyone. Outdoor Mini Bar: A wall-mounted mini wine rack for you and your guests to enjoy summer cocktails. A rolling cart works, too. Make it a self-serve bar and fill it with different cheeses, olives, and nuts. It doesn’t have to be elaborate. Your guests are sure to enjoy this, and you will, too. Light up Your Night: For an inexpensive way to enhance your outdoor space, string lights. If you are planning on entertaining after sunset, these will add ambiance to your setting. This is perfect no matter how big or small your patio and yard are. Also, globe lights small in size look great woven though fences, trees, or hung overhead. Soften up the Ground: Make your outdoor space softer underfoot by adding an outdoor rug. These are many different shapes, sizes, and designs to choose from. Using rugs can make your patio or deck feel like your home’s extension. Make Your Patio Private: There are lots of options to give you privacy with your guests. Use plants in containers to keep your patio shaded and secluded. Lush ferns, hanging planters, rail planters, and large containers spilling over with lush flowers can all make your outdoor space private and cozy. Cover overhead with vines on an arbor or pergola. Give an illusion of bulky plants with containers that are moss covered. Bring Throws Outside: With spring be a time of year that the weather is unpredictable, and nights in the summer get cool, guests may get cold. Have throw blankets draped over outdoor seating for your guests if the breeze gets too chilly. Set a Table with Color: Using some dishes that are mix and match, in different pastel colors, is a great way to add summertime fun. 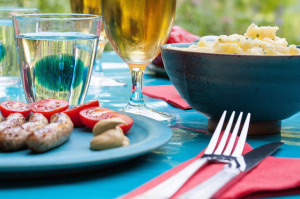 You can even make your own outdoor tablecloth by painting a dropcloth in a color scheme to complement the dishes. Or go for some oilcloth that’s spillproof and colorful. There are many ways you can grab some inspiration for the look and feel of your backyard and make it a place you want to hang out. Visit our Pinterest site – we’ve got lots of pins to spark your creativity! When you’re ready to move on to the next step and put in an outdoor room that’s got all you need, give us a call – we offer free initial in-home landscape design consultations. There’s still time to get that perfect outdoor living space installed for use this summer.